Upcoming session dates will be posted soon. Contact us to talk about bringing this virtual workshop to your organization. Remote and virtual teams are a fact of life. Over 80% of teams and 90% of projects have at least some members not co-located with the rest of the group – and the truth is if you have one employee who works away from the rest of the team part of the time, you have a remote team. And while managing and leading a remote team isn’t intrinsically more difficult than a co-located team, it is different. And we must acknowledge and address those differences if we’re going to be successful. Yet many leaders struggle to get results they need with their virtual team. They struggle to build solid relationships and trust. They struggle to engage and motivate their team. They struggle with the technology – which tool to use, how to use it appropriately and to its fullest ability. 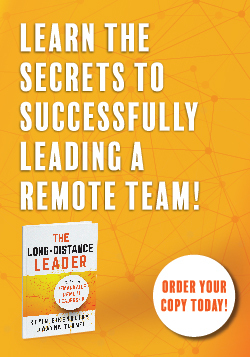 In this powerful program, we will help leaders to better understand the challenges and possibilities of remote teams. In an interactive environment, we work with leaders to assess their current team strength, and help them to speed up adoption of technology, build trust and develop solid working relationships even when people can’t get together in person. What good is saving money on time and travel if teams aren’t productive and have the kind of strong working relationships that get the work done? Learn core leadership skills for the way we really work today. This 2-hour webinar workshop is a small group experience – the class size is capped at 10 participants to allow maximum interaction and learning. The course includes a tool to assess your current team health in three areas, copies of the course visuals and a PDF packet of planning tools they can use in the future.